One abiding utopia that the computer points to is the paperless office. The engine of 'prosperity' is now intellectual capital, generated and exchanged in cyberspace in multimedia form, at a breakneck pace that paper cannot keep up with. Print and paper form an older technology that has its place, but can hardly match the plasticity of the virtual world, in which the sheer volume of bits and bytes, maneuvered and manipulated, overwhelms the capacity of print machines. Information is simply too fluid to be captured by pen on paper. Yet the sheer abundance of information, easily and endlessly reproduced and passed around, creates its own problems. Communication overload can lead to data saturation, email fatigue—excess leads to boredom, not enthusiasm, to the illusion of participation, not real engagement. Furthermore, the growth of the Internet parallels the growth of mischief in the form of hackers: just as the law reaches out with its long arm, the hacker (or worse, the cracker) reaches out with his—he can erupt at any place and anonymously attack anywhere on the world wide web. And then there are pathogenic mutants like SPAM and malicious code that roam cyberspace—this is advertising at its crudest and, in terms of harmful viruses, most dangerous. Is this business growth or a waste of our time? A useful time-saver or a recipe in the self-destruct mode? I like the push-pull analogy when comparing media: TV is primarily a 'push' technology since the content is largely thrust at the viewer—at most he can choose a channel, but little more, though interactive TV is on the cards. And an obvious 'pull' technology is of course the Internet. Truly interactive. We 'pull' or actively summon what we want to view. Of course irritating pop-ups intrude, provoke, and keep pushing at us things we may not care to indulge in. A satisfying way to surf the Web is to be inspired to do so by some preconceived ideas, word associations, or images that stoke our curiosity and serve as a trigger to browse. The Web then provides occasions for stimulation and surprise. Taunts or invitations to do so by TV, print or radio don't serve that purpose; they provide only the lure. If all we want are 'temptations' and 'seductions', then our time is compromised, and well-directed, aesthetically more appealing searches fall by the way. Enter Google, the search guru of our age—it has literally taken search into the stratosphere. Yet it is still found wanting. Search engines are now studied the way theories in physics are. The whole concept of information retrieval has been transformed. Scientists and software engineers are now looking at the way humans actually 'process' information so they can devise better ways to find exactly what we want from a burgeoning and bewildering database of knowledge and information—on the Web, on desktop PCs, in labs and libraries. Indeed, commerce and technology have joined hands to democratize all knowledge, as Google has begun to do by digitizing the contents of major libraries and making them available online. Thus the obvious concern: separating the wheat from the chaff, the jewels from the junk, the genuine from the fake, the credible from the incredible. The Web can be like an endlessly flowing but polluted river, or it can be like a collection of Great (hidden) Books & Ideas that edify, delight and enlighten us. It can be a drug that becomes addictive through repetitive abuse, or a spiritual injection every time we log on. As search engines prove, the narrower the search the better the results. And that can be supplied by the idiosyncrasy of the individual, not by the constant chatter of the media. We speak of the Man-Machine interface. But the more important interface is the Man-Mind one: How the self organizes knowledge and its connection with life in terms of the way it perceives and understands things. In short, what does it mean to acquire knowledge, to know something; and more important, what does it mean to understand? The internet is yet another symbol of the revolution of mind. It's not about economics—the efficient use of scarce resources that are essential for survival—but an intellectual leap, a crucial aspect of our social and cultural evolution. How do we communicate, create, and to what ends? It is not the particular physical form or convenience of information technology that is important, but the way we actually interact, and the way we would like to interact with it to make it an integral, yet not an obstructive part of our lives. The rest is just a game, just technique that feeds on itself, generating ever more complex patterns that need to be managed if we are to make any sense of what's going on, and the effect that has on us. The medium is still, largely, the message. Can we liberate content from pure form? The seductions of form, intricacy and speed saturate the net-verse but if they take up too much space in our brains, the loss is ours. The Digital Age could well turn into a monstrous Digital Ache. Little space will be left over for those crucial questions that formulate a vision of society. This naturally melds into an organic, evolutionary view of the Web as an organism which evolves according to our wishes and special choices. Peter J. Bentley recently published a book titled "Digital Biology". He specializes in the new discipline of evolutionary computing. His basic premise: microchips are educable. The two biologies, digital or natural, are symbiotic—just as computers can be lifelike, biologists realize that in many ways life acts like a computer. Biochemists now treat genes as if they were lines of code in a piece of software. 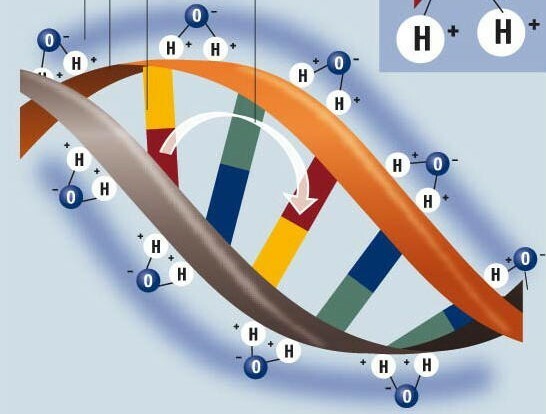 Moreover, the DNA double helix has electrical properties (see figure below) that could be exploited in the interests of computing. This is a fascinating area that begs to be explored, both at the level of computer or neural networks, and of the chip or gene.